Introducing New Shoot - if you havent heard of them, keep reading! They produce awesome fitness DVDs. Their focus is to film authentic yoga, fitness & lifestyle content for worldwide distribution. The aim of New Shoot Pictures is to continually create the very best health, fitness and lifestyle content featuring extremely talented artists and filmed with state of the art technology. New Shoot produces, films, edits and distributes our own original productions as well as finished programmes of other labels that are a good fit for the catalogue. Keep reading below for a detailed review of a wonderful New Shoot DVD and stay tuned on the blog for reviews of many of their awesome workouts. Their DVDs are available in US or UK versions. 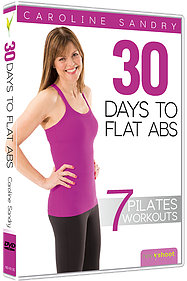 This DVD contains a 30 day workout plan available from the menu, which combines workouts, or you can choose one of the individual workouts, also available from the menu. There are six approximately 10 minute routines, a warm up, and a pilates tutorial available to choose from. Caroline works out alone in a warehouse studio, and the workouts are done in voiceover. You will need a light set of weights for one of the routines. Level 1 Pilates: Exercises include supine toe drop variations, crunch variations, oblique crunches, V drops, roll backs, table top pelvic tucks, table top knee hovers, and a prone low back series. Pilates for Posture: Exercises include standing arm sequence for your shoulders, standing roll down, bird dog, prone low back work, cat cow, kneeling shoulder openers, pelvic tucks & tilts, bridge & bridge hold with scissor arms, and supine twist. Standing Abs: Exercises include standing knee raise & turn out series, side elbow to knee pull, knee cross pulls, standing cat cow, and runners lunge adding rear leg raise. Level 2 Pilates: Exercises include bicycle leg variations, penguin heel taps, 1/2 roll backs, table top thread the needle, plank, & supine low work. Core Strengthener: Exercises include crunch variations with a towel beneath your low back, butterfly leg extensions, knee side plank hip drops, side lying leg raises & circles, prone low back work and stretches. Level 3 Pilates: exercises include the hundred, bicycle, supine twist, side lying waist work, supine low back work adding side bends, roll backs, and includes some stretching interspersed. Supercharged Abs: Most exercises use light hand-weights in this routine. Exercises include oblique crunches, roll backs & row, V twists, bird dog, supine low back work, V drops, reverse crunches & double crunches. These routines range from beginner to intermediate intensity. These routines are a combo of pilates, yoga, and core work that contain a nice variety of exercises. This DVD has a lot of footage and a TON of variety! Great fusion style workouts and Caroline provides great instruction. I received this DVD to review. I received samples of these products to review. I was in no other way compensated for my honest reviews. All thoughts and ideas expressed are my own. I am disclosing this in accordance with the Federal Trade Commissions 16 CFR, Part 255 Guides Concerning the Use of Endorsements and Testimonials in Advertising. Please see my disclosures page for details. Do not copy, in whole, or in part any portion of any postings on my blog. Do not repost my content on any other site without my explicit consent. All of my postings belong solely to lindsey8.blogspot.com. Do not copy, in whole, or in part any portion of any postings on my blog. Do not repost my content on any other site without my explicit consent. All of my postings belong solely to lindsey8.blogspot.com. Prebiotin Prebiotic For Gut Health, Bone Health, Heart Health, Weight Loss & MORE! Denise Austin’s 10 Week, 360° Plan: Everything You Need To Get in Your Best Shape!